If you're an avid reader of ChopCult, you know that I help Kutty and Jamie Noteboom with the Hippy Killer Hoedown. 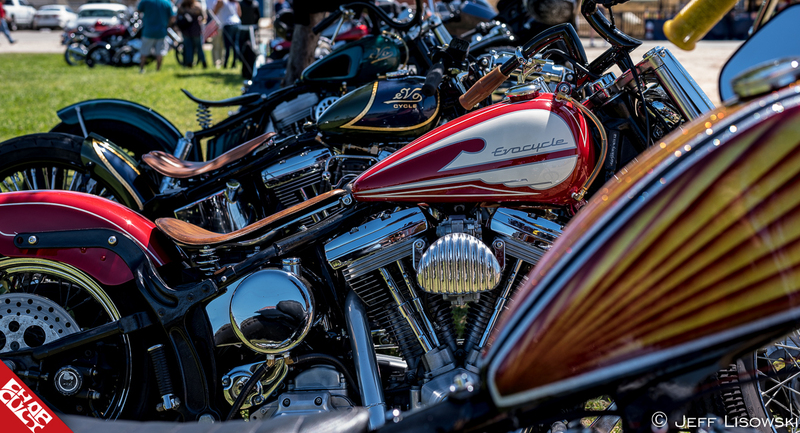 Over the years, the Hoedown has grown to become a premier event that brings custom motorcycles, cars, and vans together in perfect harmony. It's been my job to secure the vendors and sponsors, layout the area, and work the back gate on the day of. Kutty and Jamie deal with the day-to-day tasks and secure the live entertainment. We all meet on Friday to lay out the grounds and get ready for the next day. My gate's used as the main access to the Hoedown for vendors, sponsors, and show vehicles. These people are the real stars of the Hoedown, as they help provide the eye candy and products for the crowd to enjoy. It's awesome to welcome back friendly faces and companies that have supported the Notebooms year after year. Autry Berroteran, aka my gate dog, has worked with me for many years and I'd be lost without his assistance. It's our job to continue to welcome the motorcyclists once the show opens at 10 am. The best part of working the back gate is that you get to see every custom pulling through the gate. I couldn't help but smile when I heard Rich Silva's sweet Denvers chopper rip down the main street. 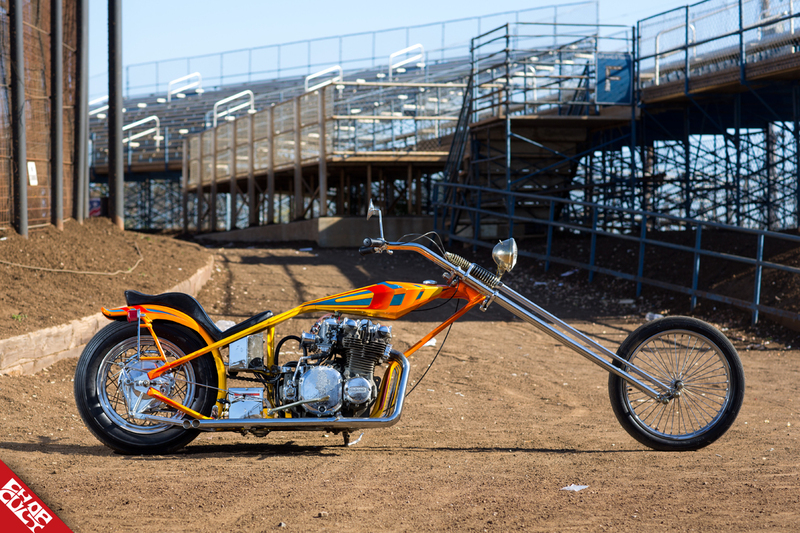 There's something about a 70's motor that creates a sound like no other. Photo borrowed from El Denver's feature. The Hoedown is a family owned and operated event. Meaning Kutty's mother, Helga, greets the general public and his father, Bones, oversees the placement of the custom cars with the help from The Lords of Riverside Car Club. Jamie handles the event booth with their extended family and close friends like Melanie and Sean Buckley. Justin Brown, Billy Crewl, and Marty Felan help place the vendors and work with Kutty for the rest of the day. If the Hoedown looks like a well-oiled machine, it's because of everyone that helps behind the scenes. 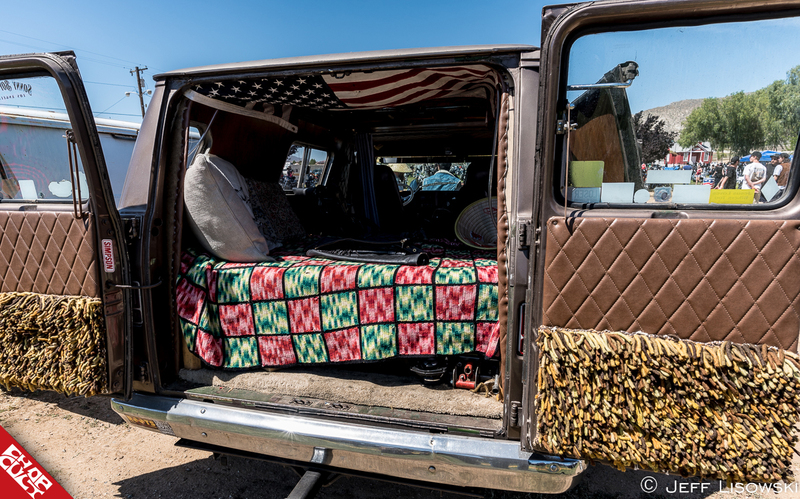 Matt Grayson, from Rolling Heavy Magazine, curated the van section of the show, Jeff Holt provided a spot on the upcoming Hot Bike Tour, and Mikey Ratt helped organize the mini-bike races. Big thanks to Matt, Jeff, and Mikey for their many years of support! I'm sure I'm missing a few names, but please know that you're appreciated. The main goal of the Hoedown is to provide an affordable, family-friendly, event for all to enjoy. Kutty has secured many great bands in the past, but I thought this year’s line-up was the best. Gotta give it to Lorin Walker Madsen, Chux Myth, Arkansas Toothpick, Revolution Mother, Bob Wayne and The Outlaw Carnies, The Cadillac Tramps, and Guttermouth for delivering perfect sets. Between performances, free product is tossed out to the crowd. This tradition is made possible through the generous donations from The Noteboom's, sponsors and vendors alike. One thing I never bring is my camera, so I rely on fellow local contributors to help me obtain imagery. This year Nick Faught sent some of his personal best for social media use and Ryan Loughridge worked on securing Rick Silva's feature. Jeff Lisowski was scheduled to work out of town, but still attended and delivered the images you see below. This is another form of teamwork that I really appreciate, as each person made sure I was taken care of. Thanks, guys!